A poacher, Ted Barker, sets some rabbit traps in a field, and stares at the sky when he hears a crack of thunder. There's a sudden cloudburst and he rushes for cover; the deluge becomes a torrent and he's knocked from him feet, collapsing into a growing lake of water. 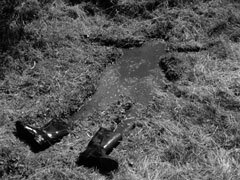 Steed takes Emma to the field where the poacher died, his soggy impression still in the turf. She's aghast to hear he drowned in the middle of a field. Steed shows her that another villager from Lower Storpington, Jonah Barnard, has written to The Times ten times, advocating the building of Arks as the Great Flood is coming. She goes to see the poacher's brother, Eli (Talfryn Thomas), who tells her his brother was an evil sinner who fell into the pit of iniquity; he puts Ted's death down to the demon drink. It starts raining very hard and Eli tells her, while he puts pots and pans under all the leaks in the roof, that they've had torrential rain for months and he considers Jonah a great man whose warnings should be heeded. He tells her Ted stole liquor from Grannie Gregson's Glorious Grogs, a factory nearby that has tanks of spring water "big enough for a man to drown in". He goes to help Jonah spread the word, leaving her to finish her tea under an umbrella. Steed meanwhile visits Jonah (Noel Purcell), who is imploring the laughing villagers to join him in building an ark. Eli arrives and supports him but the villagers heckler them and wander out, chuckling. Jonah is sad that he has not saved them. He is heartened when Steed joins them and says he read the letters in The Times. Jonah tells him he has had warning of the flood - butterflies and birds that prefer a watery habitat have suddenly appeared in the area. Jonah then tells him of a cloud that is in the same place every day, save that it gets larger - he points it out to him, hovering over the wine factory. Dr Sturm (Albert Lieven) is in his lab with Martin Smythe (Geoffrey Palmer), who explains he is late because of the weather, then quips that the wine Sturm is tasting is too dry. The secretary, Joyce Jason (Sue LLoyd), informs them a Mrs Peel wishes to see Dr Sturm about Ted Barker. 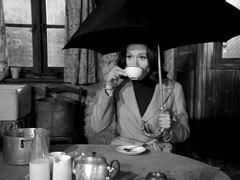 Mrs Peel claims to be a free-lance journalist, who thought there might be a story in the death but Sturm tells her their security is very strict and Barker could not have drowned in their tanks. He bids her good day abruptly and when she tries to follow him, she notices rows of raincoats and umbrellas in the hall. Emma return to Eli's house and gets him to tell her how his brother got into the factory on the pretext of preventing Grannie's Grog from corrupting more sinners. They arrange to meet at the place at 9 o'clock. Steed discovers later that Mrs Peel has left him a puzzling message with Jonah - she's gone into the 'pit of iniquity', which has given Jonah a very low opinion of her. 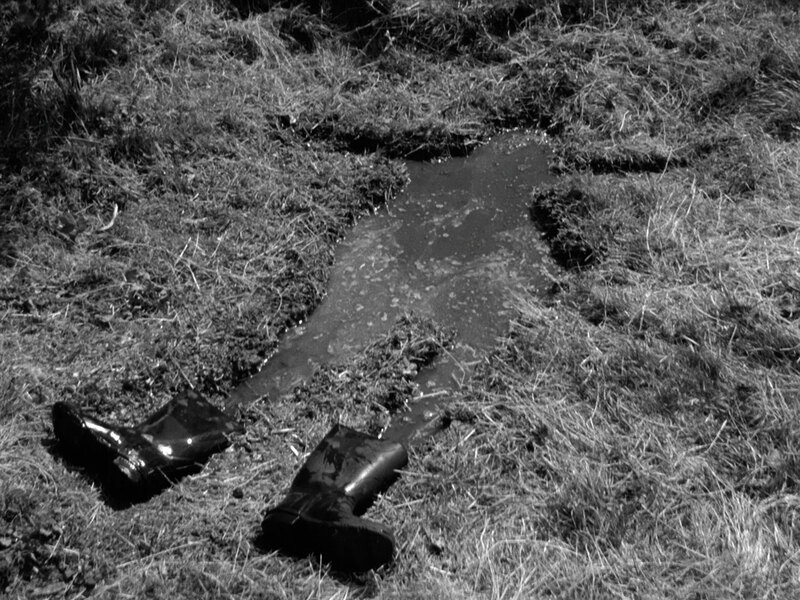 Mrs Peel arrives in a figure-hugging little raincoat and fails to notice the new, man-shaped, bog near the factory. She enters and finds Eli drowned in one of the tanks, which she reports to Jonah and Steed. Jonah bemoans that he failed to save him from The Flood while Steed goes to 'buy some wine'. He poses as a wine merchant, wishing to sample Grannie's grogs. Joyce tells him Dr Sturm took over the plant two years ago, introducing modern techniques and machinery, but is a busy man. He refuses to buy from a catalogue, saying he must sample the wine; she relents and checks with Sturm - while she is gone, Steed searches the office, finding a weather map of the area under some sales figures. She returns and takes him to see Dr Sturm, who displays a poor grasp of vintnery. 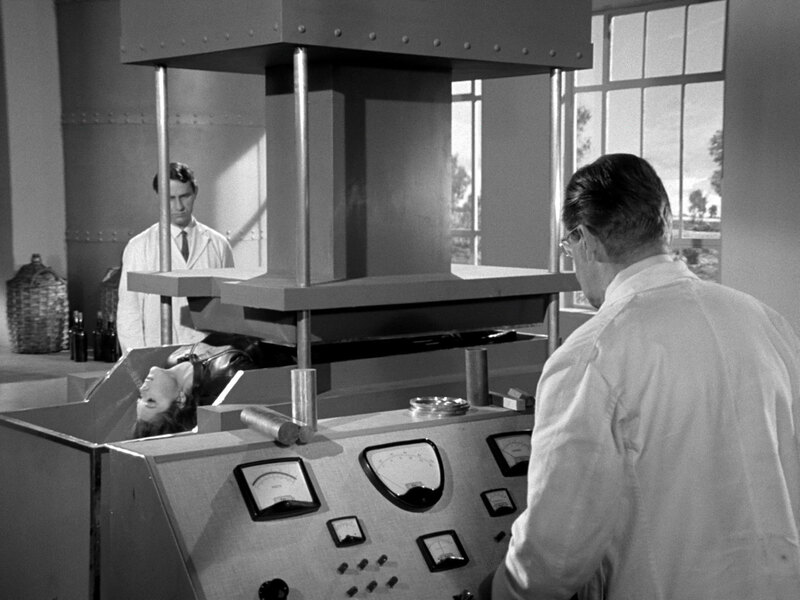 Smythe is distrustful of Steed and thinks it a mistake to let him in but Sturm happily demonstrates his press which pulverises fruit and vegetables with 40 tons of force - but can be controlled to 1/1000". Joyce leads him to the wine store and he agrees to purchase several gross of buttercup wine. He comments on the sound of pouring rain he can hear, and greets Sturm's assistant, Frederick (Terry Plummer), when he enters, shaking the rain from his oilskin and sou'wester. When he leaves the factory, he is puzzled to find himself in bright sunshine. He returns to Jonah's shed where Mrs Peel is setting up a portable weather machine and they drive to the field where Ted was drowned. 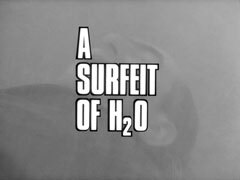 Smythe sees them taking measurements in the field and calls Sturm over - Mrs Peel thinks her equipment must be faulty so they return to Jonah's to collect Sir Arnold Kelly (John Kidd), the nation's preeminent meteorologist; he too distrusts the 67.8% humidity reading. By the time they return, Frederick has smashed all their equipment. Sir Arnold starts using his own equipment while Mrs Peel drives Steed back to the winery. He acts the buffoon and makes his way inside, spotting a crate topped with pulverised dry ice in the lab. In the store, he tries the door from which he can hear the rain, but it's locked and Joyce marches him out. He asks Sturm about the noise and is told it water falling into the vats, demonstrating with a tap. Frederick turns off the tap as Smythe spots Sir Arnold in the field. He grins and says he's not wearing a macintosh. "A pity", says Sturm, "it looks like rain". 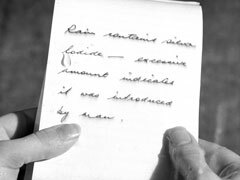 Sir Arnold's notes the rain is man-made then seconds later is caught in a monsoon and, losing his spectacles, gropes blindly about and is drowned in the deluge. Discovering who he was, they realise Jonah's letters have aroused interest and Smythe and Frederick are dispatched to Jonah's. Smythe asks Mrs Peel to accompany him to the plant - at gunpoint - while Frederick pretends to help Jonah finish the Ark. Mrs Peel is strapped in the vegetable press and the weight descends - with just enough pressure to trap her, but not to - yet - harm her. Sturm advises her to answer his questions when he returns, or face having her ribs broken. Jonah is preaching a sermon - to a small boy and his dog - when Steed returns. He learns Frederick was there and Mrs Peel hasn't been seen since he arrived. Steed investigates Frederick's work on the Ark and discovers sabotage that was meant to kill Jonah. He and Jonah travel to the field, finding Sir Arnold's notes, and Steed realises the field is most dry, despite the high rainfall. He traces the sound of rushing water to a manhole hidden under the turf and they descend into the dark. Mrs Peel is being questioned by Sturm, who applies more pressure. He tells her he's created rain as the world has never seen before, rain as a military weapon, and he will not be stopped now. "You diabolical mastermind, you", Mrs Peel murmurs. 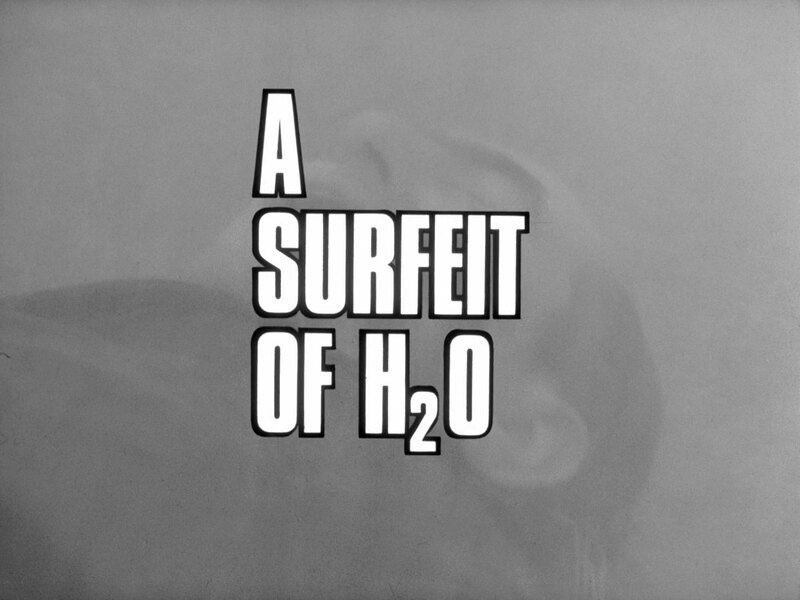 Jonah and Steed hear them from the sewers and, when Joyce calls Sturm away, enter to rescue Mrs Peel. She tells Steed the lever should go up - so he pushes it down, as she was on her back when Sturm operated the machine. Steed demonstrates his mastery of the press - but ends up flattening his bowler hat. They enter the wine store and dispatch one of the staff before breaking into the rain-making area, where they find the machine that has been producing rain for over a year. Joyce discovers Mrs Peel gone and raises the alarm, and the villains rush in just as our heroes are contemplating the machine. Jonah knocks out Sturm just as he pushes the lever down on the machine and as he collapses, he pushes it all the way to "Tempest". Jonah is in a religious ecstasy, proclaiming the flood is come, as they battle in the downpour. Eventually, our heroes prevail and they carry out the vanquished, but discover Sturm has been drowned by his own machine. Mrs Peel collects Steed from Jonah's in her moke. She sneezes and he offers her a tot of Grannie Gregson's marrow rum before they drive off into the countryside.